It’s been TOO long since we’ve made a public post about our progress! We’ve been giving our Patreons the latest alpha builds, but over the past few months, we ran into a snag. These past months, we had to spend time finding a new place to move because our unit was being sold (so that was a bit chaotic until we found a new place.) We've been working on minor tweaks to the build through that time, but will continue to round out the demo more this month. We should have another build available to Patreons for testing in the coming weeks! 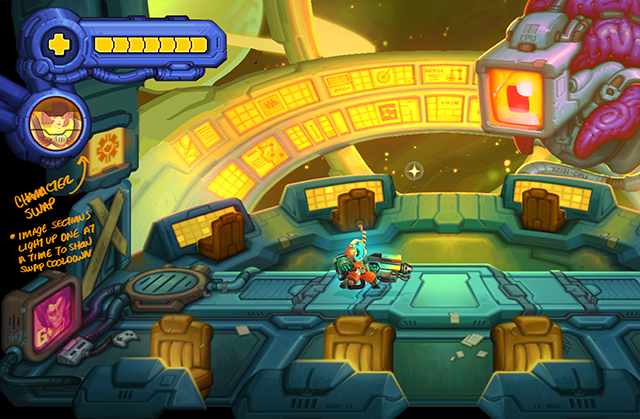 We also wanted to announce that the demo will be available to play at PAX South this weekend! Look for Thar Be Monsters and our banner at Booth 10412! Besides that, we're going to be trying our best to wrap up this demo, and very sorry for the long silence. If you have any questions, please feel free to ask! Thank you again for the continued support. To accompany our text boxes, along with some unique gestures from each character! Having lots of fun creating 2d sprite work with software like Maya! CPU Animation in the Clinic! Hey Busters, it's been a loooong while & we're sorry for the lack of public updates. Since the end of last year, we've been working hard on gameplay so that we can finally get the new public slice released sometime in May! In the meantime, we'll be doing a few more dev streams (you can catch the previous streams from this past month with Paul on our Twitch!) and doing our best not to keep our heads down so we can keep sharing awesome updates with you. 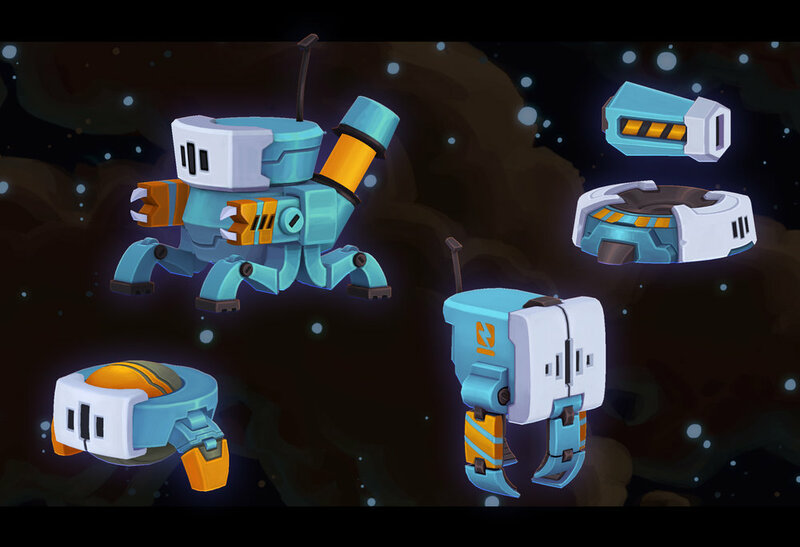 Here's a small slice of the new robot enemies & whales you'll be helping. And some WIP shots of our start screen and lab you can visit in the space station! We are so excited to finally reveal our newest NPCs in the station. The constructed siblings - Salt & Pepper! These two eccentric sisters handle the research and development affairs on the station, residing in the Research Wing. Having been raised around science their whole lives on the station, they’re both prodigies in their own right but they couldn’t be more different! Salt, as the first creation of the chief scientist, was built to tend to the efficiencies of all things organic in and around the station. She maintains a vast collection of patient samples from all around the system to better study and treat their infections. Her deep knowledge of all things infectious will help the crew improve and upgrade their equipment to better fight off anything that comes their way. Sweet and kind in demeanor, she acts as a motherly steward for the patients that come to the station for care. She also has something of a geek streak about her work and tends to get irrationally excited when presented with a new sample or creature she’s not yet encountered. Social situations are hard, okay? Her less-than-stellar programming has morphed her interest in pathology into something more akin to an infatuation - She’s deeply passionate for anything in her care and won’t stand for mistreatment or malpractice of any kind, so do your best and don’t disappoint her! Pepper is a spunky, energy-packed child with a knack for all things mechanical. She spends her days rattling around in the belly of the station, repairing broken machinery, building oddball contraptions and causing as much noise as possible. Pepper provides the crew with the means to outfit the station with the latest and greatest tech. Stitched together from a box of left-over convict remains lifted from a nearby prison barge, she has a near limitless physical strength despite her petite stature -- A perfect fit for the station’s mechanic! Mix that with a fragile ego, though, and she may be one tantrum away from complete destruction of the home she works so hard to keep running. Here are some extra model shots & concept for them! Lots of streaming, busy work & reveal soon! It's been really fun streaming for you guys and we hope you enjoyed the concept, texturing and animations we've shared so far. We'll be doing some more in the near future, so keep a look out on our social media pages and our Twitch for the next one! Anyways, here's some colorful visuals for your eyes. Enjoy! New characters, enemies & a thank you! 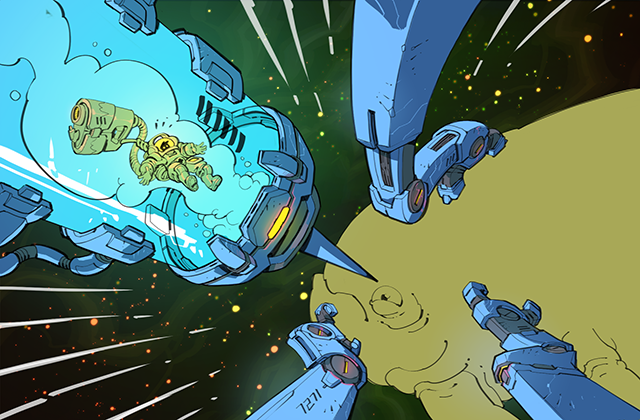 A new alien race in the galaxy! After the deaths of all the surgeons, CPU realized that future surgeons may be better off with these helpful revivor bots. They only come with so many charges, so perform with caution! Our favorite (and only) head of the station is coming to realization. Don’t you want him to hug you with those chubby brain-y arms? We also had some streams for textures & animation that you can check out here and here! For those of you who participated in the community level voting, here are all of the final results. 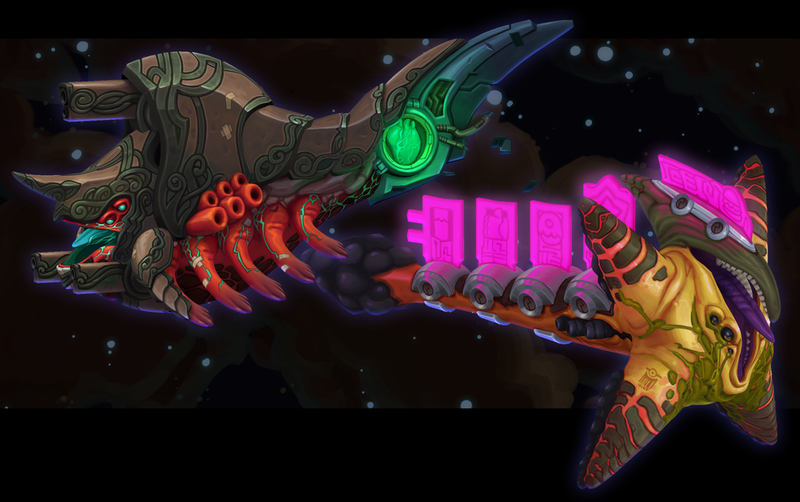 Prepare to fight brain parasites in a domed city hidden inside a space whale! Rudy in Bounty Battle, Patreon & more! After hearing all of your feedback, we’ve decided to launch a Patreon page to help with some of the funding for developing our new demo! New flying Parasite learns to swim! We’re also working on our swapping mechanic so it feels nice & smooth when you switch out characters. More gameplay to come soon! Another new NPC awaits Rudy in the station! Clean up the competition in Bounty Battle! As many of you may already be aware of, Rudy is going to be a playable character in the indie fighting game, Bounty Battle! Fight as or against some of your favorite indie game characters from games like Guacamelee, Awesomenauts, Darkest Dungeon, and more in rapid 4-player combat. Rudy also comes with a Biter sidekick that you can summon to fight along your side! Who ever saw that coming? Their Fig campaign is now up and running, please consider supporting this awesome indie fighting game!